2000; 221 pages. 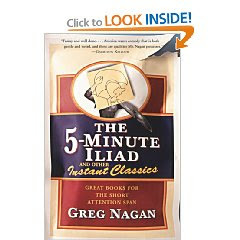 Full Title : The 5-Minute Iliad and other Instant Classics. Great Books for the Short Attention Span. Genre : Literary Spoof. Overall Rating : B. Would you like to read the classics, but have neither the time nor the attention span? Do you want to impress others by doling out some literary ponderings ("Didn't Mrs. Dashwood have her hands full bringing up three such precocious girls in Jane Austen's 'Sense & Sensibility'? "), without actually having to trudge through the whole book? Do you think The Iliad would be much easier to read if Homer had put some humor in it? If so, then The 5-Minute Iliad is for you. 15 shining examples of Western Literature Classics, each distilled down to 10-15 pages, each easily read in 5-minutes or less. There is a lot of satiric wit, but Nagan also makes an effort to write each entry in the style of the original. On The Road is a single, 12-page, run-on sentence. The Old Man & The Sea nicely captures the fisherman's rambling monologue to the fish, as his boat is pulled out to sea. And of course, nothing compares to the limerick style used by Dante when he wrote The Inferno. Nagan also prefaces each selection with a page or so about the author and the times in which the book was written. These are especially tongue-in-cheekish. And as a bonus there's a 5-minute section detailing everything worth knowing about Western Civilization from Gilgamesh to the present. A couple caveats. This is not a book for the kiddies. There are a few cuss words, and some "sexual situations". But you'd expect this since the list includes works by Salinger and Kerouac. Also, it helps if you are at least familiar with the classic; even better if you've read it. The only ones I've read on the list are 1984 and Metamorphosis. I've seen the movie The Old Man & The Sea, and I think I read The Iliad in high school. Those are the ones I liked the most. I'm familiar with most of the others, except for The Picture of Dorian Gray and Sense & Sensibility. Those are the two I got the least out of, cuz I couldn't tell what was actually from the story, and what was spoof. I give The 5-Minute Iliad a "B", only because I don't know if any spoof merits an "A". For you young'uns, the humor here reminds me of Dave Barry's columns. For you geezers, it's very close to the "It All Started With..." series from the 60's by Richard Armour. Sadly, Greg Nagan appears to be a one-hit wonder. This is his only book that Amazon carries, and he doesn't even rate a Wikipedia entry. Highly recommended. You had me at "sexual situations" ;P This looks like one I'd hate to miss. I wish I'd have thought up 5 minute classics, darn it. Instant classics. I might have to pick this one up as well. This looks great! I've read nine of the books you listed; it would be fun to see them condensed. The Picture of Dorian Gray is very short and easy to read. Many people like it even if they don't normally read classics. This looks like a fun book. I remember slogging through some of those in college - it would be fun to be able to laugh about now. heh Alyce - the toughest read i remember from college is Waiting For Godot. the prof dearly wanted us to love it. but he was dealing with a class (on Saturday mornings, no less!) whose idea of a good read was Flowers For Algernon and Lord of the Flies. many years later, i re-read WFG, and loved it. tis a pity the prof will never know that his promoting of his pet book eventually bore fruit. This is without a doubt one of the funniest books I have read. You will lol. Seriously.